Peptide (CD)TINGTWEGDELGYK, corresponding to amino acid residues 11- 24 of rat P2RY2 (Accession P41232). Extracellular, C-terminus. Homology Rat, mouse – 14/15 amino acid residues identical; human – 13/15 amino acid residues identical. 1-4. Anti-P2Y2 Receptor (extracellular) Antibody (#APR-102), (1:200). 5-8. Anti-P2Y2 Receptor (extracellular) Antibody, preincubated with the control peptide antigen. Immunohistochemical staining of perfusion-fixed frozen mouse brain sections with Anti-P2Y2 Receptor (extracellular) Antibody (#APR-102), (1:200), followed by goat-anti-rabbit-AlexaFluor-488. 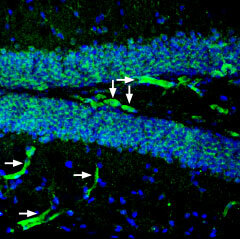 P2RY2 immunoreactivity (green) in the hippocampal dentate gyrus appears in blood vessels (horizontal arrows) and in neurons (vertical arrows). Cell nuclei are stained with DAPI (blue). __ Cells + rabbit IgG isotype control + goat-anti-rabbit-FITC. __ Cells + Anti-P2Y2 Receptor (extracellular) Antibody (#APR-102), (5 µg) + goat-anti-rabbit-FITC. Wang, L. et al. (2002) J. Cardiovas. Pharmacol. 40, 841. Di Virgilio, F. et al. (2001) Blood 97, 587. Yerxa, B.R. et al. (2002) J. Pharmacol. Exp. Ther. 302, 871. P2Y receptors belong to the G-protein coupled receptor superfamily. P2Y receptors mediate the actions of the extracellular nucleotides (ATP, ADP, UTP and UDP) and regulate several physiological responses, among them, cardiac function, platelet aggregation and SMC proliferation1. The mammalian P2Y family currently includes eight functional receptors; P2Y1, P2Y2, P2Y4, P2Y6, P2Y11, P2Y12, P2Y13, and the UDP-glucose receptor, now renamed P2Y142-4. Anti-P2Y2 Receptor (extracellular) Antibody (#APR-102) is a highly specific antibody directed against an epitope of the rat protein. The antibody can be used in western blot, indirect live cell flow cytometry, and immunohistochemistry applications. It has been designed to recognize P2RY2 from rat, mouse, and human samples. Anti-P2Y2 Receptor Antibody (#APR-010). This antibody recognizes a different epitope and can be used as a control for detecting P2Y2 receptor. Anti-P2Y2 Receptor (extracellular)-FITC Antibody (#APR-102-F). This FITC-conjugated antibody can be used to detect P2Y2 in live cell flow cytometry.